Considering how far in advance weekends get booked up for this party or that event, I'd like to speak up now to reserve Saturday, Feb. 9th, for a LASFS outing to Griffith Park. This will be a combined picnic and planetarium trip; we'll meet in the Fern Dell area for a barbecued picnic lunch around noon, then go up to the planetarium later in the afternoon to see the astronomical show and scientific exhibits. Further details will be worked out later, and the date may have to be changed if Feb. 9th looks like it's going to fall in the rainy season; but for now, let's plan on this date. This outing will be different in one respect from previous LASFS outings, though. Instead of being a come-one-come-all affair, we're going to try and hold it down to 20 or 25 people, and there will be a fee of 50¢, payable in advance, which we'll use to buy the barbecue fixings. This will not be a bring-your-own-lunch affair; the food will be provided for the attendees. But to know how many people to cook for, to keep the group down to a manageable size, and to keep out the fans who never bring more than a couple of cookies and then sit around looking hungry through the lunch, there will be a limit on attendance. Basically, attendance will be limited to the first 25 or so fans who definitely sign up and pay their 50¢ by the last LASFS Meeting in January. Bĵo has agreed to take charge of making sure the barbecue is run properly, so you know that you can count on a filling and tasty lunch. See me if you want to sign up. LOCUS has been saying nice things about SHAGGY and Apa L lately, and it's time the compliment was returned. LOCUS is a very good newszine, published by Charlie & Marsha Brown of New York fandom, and everybody who wants to know what's going on in the s-f pro and fannish world should subscribe to it. Previous newszines usually boiled down any news sent to them, and published it in condensed form, in issues of a couple of pages each. LOCUS accepts letters of news and prints them more or less verbatim. The result is news in a much less formal manner, consisting to a large extent of a collection of letters from actifen all over the world telling what's been happening in their fan groups during the last few weeks. The result is readable, interesting, and runs to issues of 6 or 8 pages every couple of weeks. For an example, LOCUS #15, dated Dec. 19th, tells of an auto accident that happened to Marion Breen; that VENTURE SCIENCE FICTION, F&SF's old sister magazine, is being revived with the May, 1969 issue; of a new Australian prozine; of editorial staff changes at various prozines and paperback houses; of forthcoming s-f titles from various publishers through February. There are columns of fanzine news, sf club news, of convention news. 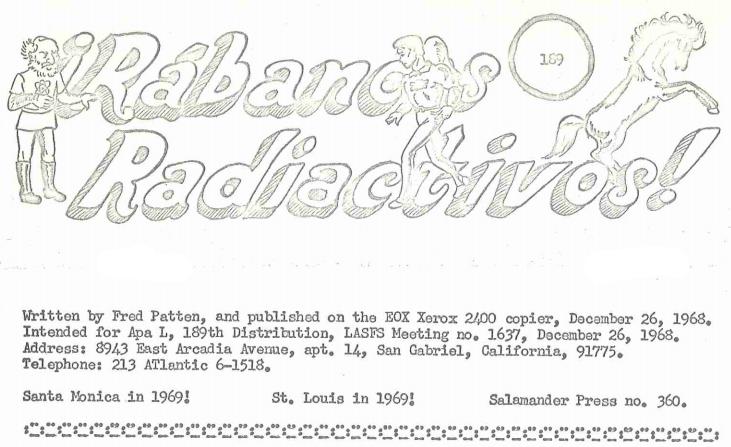 Jack Chalker writes to announce that Baltimore is with drawing its bid for the 1971 WorldCon. Hans-Werner Heinrich tells what's happening in German fandom & prodom; and Carl Brandon, Jr. covers the Swedish scene. The column of apa news says, among other things, "APA L #186 (Dec. 5) contained 50 pages with 25 contributions. Fine artwork by George Barr (who also writes very well) and Tim Kirk. APA L #187 (Dec. 12) contained 52 pages with 21 contributions. Cover by Jack Harness." I won't bother to quote the review of the SHAGGY Christmas Supplement, but it's very favorable. If you're at all interested in fandom or prodom outside of the L.A. area, you can't afford not to get LOCUS. Especially at the low price of 8 issues for $1. Write now to Charlie & Marsha Brown, 2078 Anthony Avenue, Bronx, New York, 10457. PROBABLY SOMETHING #133 -- (Digby) Fred Garap can hold his head in the air until he drowns. S.O.S. #8 -- (Barr) A very good illustration and poem. An unusual meter, though... is it meant to be sung? ## Thank you for moving to Los Angeles and making the local fandom a richer and more enjoyable social group by your presence. It's we who're in your debt. DRAGON'S AERIE #5 -- (R. Gluckson) Do you have any information about MORE FUN in the late '40's? It published a series with a title something like "Jiminy and his Magic Book", which I've seen advertised in other DC comics of the period. From the ads, it looks like the artwork on "Jiminy" was by Walt Kelly, and I'd like to be able to find out if my guess is right or not. FROM SUNDAY TO SATURDAY -- (Fitch) It seems to me that because so much of Apa L's content is first-draft material, comments made off the top of the head, personal opinion based on what somebody else has just said, that "I" would have to figure quite prominently in it. It's almost all of the "Well, I think...", and "My reaction to your statement is..." nature; it's impossible to avoid the personal pronoun.